The merit and virtue derived from bowing this repentance can never be fully expressed. Bowing in repentance can eradicate people’s karma; bowing in repentance can nurture people’s good roots. Bowing in repentance can help people who have never done any spiritual practice learn how to practice and help people without good roots to develop them. When our good roots are full and complete, we will become enlightened. Therefore, the merit and virtue of bowing in the Repentance Ceremony before Ten Thousand Buddhas is inconceivable. We will experiment with bowing in repentance for one hour every evening. Next year we can start to officially bow the repentance. Everyone should recognize the importance of bowing in repentance; only then can you derive its benefits. We bow in the repentance ceremony before Ten Thousand Buddhas every evening. The power of this sutra is inconceivable. Ten thousand Buddhas come to protect you; therefore, you can gain everything you seek. If you seek to open up your wisdom, you will gain wisdom. If you seek to eliminate your karma, you will eliminate your karma. If you seek to gain good roots, you will gain good roots. The Ten Thousand Buddhas will help you gain good roots, and the Buddhas will come bless you to help your illness and to eliminate your karma. Thus, the repentance is extremely important. The Buddhas of the past bowed in this repentance ceremony before Ten Thousand Buddhas, as do the Buddhas of the present. The Buddhas of the future will realize Buddhahood through bowing this repentance. You see, Venerable Master Xuyun bowed in this repentance ceremony before the Ten Thousand Buddhas. I encountered a person from Fujian Province who had severe heart disease and was very sick. He bowed to each word of the Flower Adornment Sutra, making about 1000 bows each day. His heart disease disappeared. It is very important to have a sincere heart when you practice Buddhism. Sincerity will bring a response. From now on, one person at a time can request the Dharma. You can take turns. Since we don’t have many people right now, one person will suffice. If there is a larger crowd, then two people can request the Dharma. Nothing is certain -- simply follow the Middle Way. Bowing in the Repentance before Ten Thousand Buddhas is very important. If you don’t participate in this repentance, you can’t really be called a practitioner of the Way. In the past, I also did this repentance practice. Therefore, in spiritual practice, you must undergo a process of hardship and exertion, and then you’ll have some achievement. If you aren’t sincere, you won’t achieve anything at all. We do the repentance before Ten Thousand Buddhas each night, and the merits and benefits are tremendous. Those who are destined to have a short life spans can increase their life spans if they bow. If those who have many illnesses honestly bow in repentance to the Ten Thousand Buddhas, their illnesses will disappear. Some people do not have any luck in their life, and everything they do or experience is unfortunate. If they sincerely do this repentance before Ten Thousand Buddhas, they will enjoy good fortune. Practitioners who frequently do this repentance will soon attain awakening. The merits of bowing in repentance are inconceivable. I will talk about Dharma Master Cheng Xiang. I first met him in Hong Kong. He did not have much to say because he did not know many words. Later he came to Canada where he began his daily routine of bowing in repentance for five years. He finished bowing the repentance ceremony 26 times. When I see him now, he is much smarter than before. 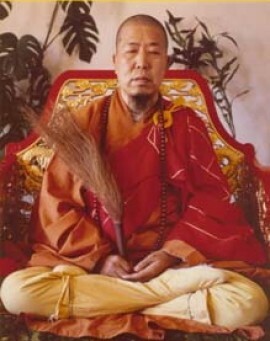 Venerable Elder Master Xuyun also bowed in this repentance. Westerners tend not to like to bow; therefore, they do not experience the merits of bowing. When bowing in repentance before Ten Thousand Buddhas, have a sincere heart. No matter what kind of illnesses you have, if you sincerely bow, you will become well and your illnesses eventually will disappear. Dharma Master Cheng Xiang is at the Vast Blessings Monastery every day, bowing the repentance before Ten Thousand Buddhas. For the last few days, he has been there bowing the Emperor of Liang Repentance, and now he is bowing in repentance before Ten Thousand Buddhas. To repent also means to reform. There is a saying, “Offenses that fill the skies disappear with a single thought of repentance and reform.” If you can repent of your offenses, they will be eliminated and your good roots will grow.